Do you like eating babies for breakfast? No, silly—not REAL babies. 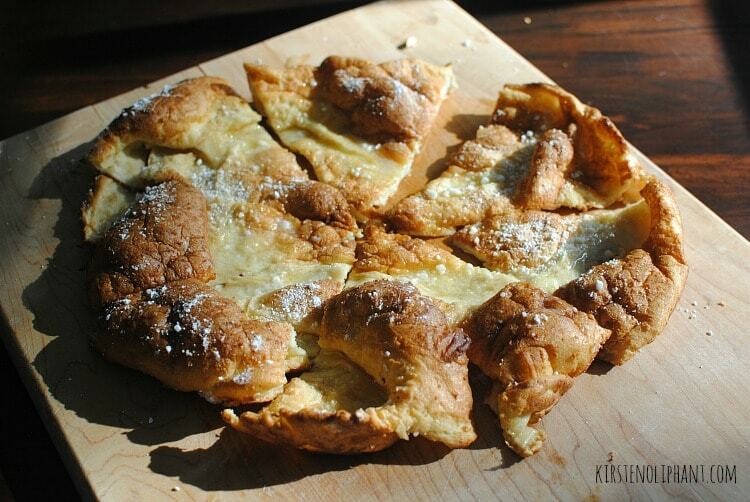 Dutch babies. Never heard of them? Neither had I before a few years ago. 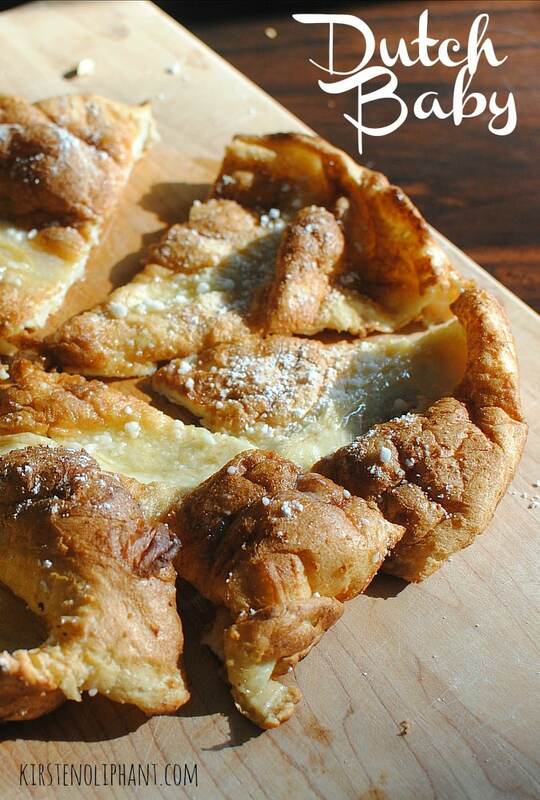 It’s somewhere between a popover and a crepe. Light, airy, bready. Buttery. Delicious. The first time I made a Dutch Baby, it freaked me out. For one: who names something you eat a BABY? Secondly: I thought for some reason (despite the flour) that it was a quiche of some sort. (It’s more a fluffy, light bread.) And C: when you take this out of the oven, it’s giant and puffy. Immediately, it sinks. If you aren’t prepared for this, you think you messed something up. You didn’t! It just sinks. So make sure you take a picture (even with your phone like I did–sorry for the photo quality) before it sinks. 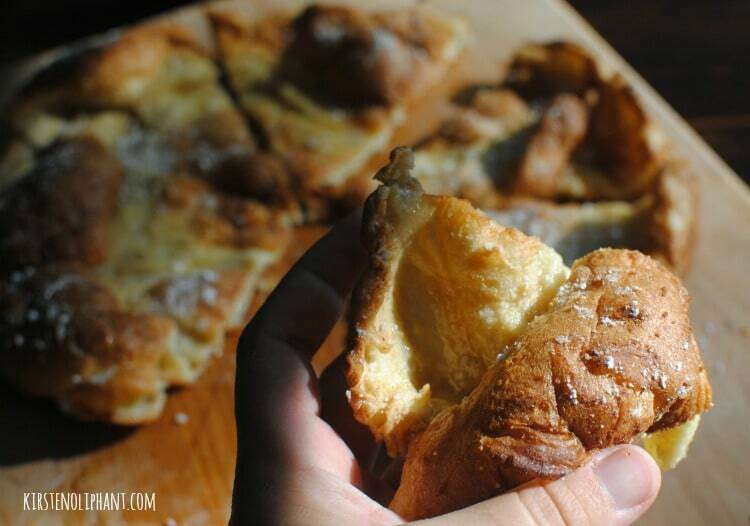 This recipe is simple, and I was inspired to try it again after seeing this beautiful Lemon Sugar Dutch Baby. Lovely, no? I simplified the recipe enough that it fits into the Stupid Simple category—so simple that it’s stupdly simple. Preheat oven to 450 degrees. Put an oven-safe skillet like a cast iron skillet in the middle rack. Beat the eggs until frothy, then add the milk and beat until well combined. Beat in the flour and salt until smooth. It will be watery. Remove skillet from oven (USE OVEN MITTS--I ONLY REMIND YOU BECAUSE I'VE FORGOTTEN THIS) and add 3 tablespoons butter to it, swirling to coat. Pour in the batter and immediately bake for 15 minutes or until puffy and golden brown. Remove from oven. Top with more butter and other toppings of your choice. I would suggest freshly squeezed lemon juice and sprinkle with powdered sugar. -All the recipes I saw online recommend having the eggs and milk at room temperature. I'm not a very patient person, so I did everything out of the fridge and it was just fine. -I used a Quick Wisk rather than an electric beater. -Many recipes use vanilla and cinnamon or other spices in the batter. I like this basic recipe so I can add anything sweet on top, but I'm sure the slight sweetness in the batter is great too. Easy, right? Our whole family loved this. I almost ate the whole thing. I can do that, right? And just blame pregnancy. Which brings me back to the thought that it’s weird to eat babies for breakfast. Even Dutch Babies. I never though that I could make these at home! This will save me a trip back to California! Thank you! 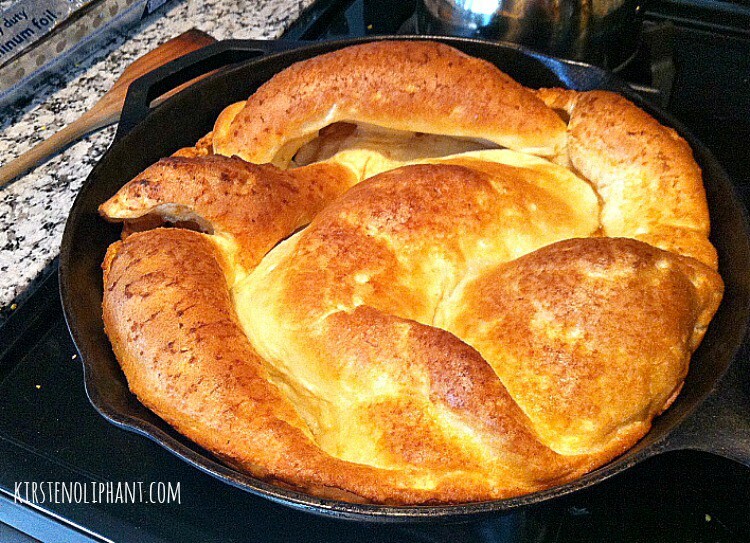 OMG, thank you for linking to my dutch baby recipe! Sadly, I can attack an entire pan of this and I don’t have a pregnancy to blame… just my big ol’ appetite. They’re soooo good, dammit. HAVE to try this! Sounds so yummy! made one of these years ago, should do it again, it was fun and yummy!